New Year’s Impressions: Monkey Hospitality? … so I decided we needed more of the letter “M.” We didn’t get to do many fun things with M – and we definitely need fun! Do you remember the frozen “Monkey Treats” you used to make back in the day, with the frozen banana and all the goodies heaped on top of it? Mmmm… I remember making them with Ms. Stephenson in the 4th grade (Hi, Ms. Stephenson!) – and I remember using peanut butter, chocolate, coconut, and peanuts. However, EJ has severe peanut allergies, so the peanut butter and nuts were right out. I hopped online to see if others had had any luck using honey instead of peanut butter. And look at the yummy recipes here! 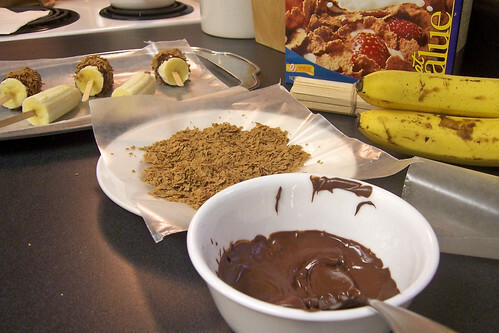 I was thinking about dipping the bananas in honey and covering them in chopped up chocolate chips and crushed cereal. 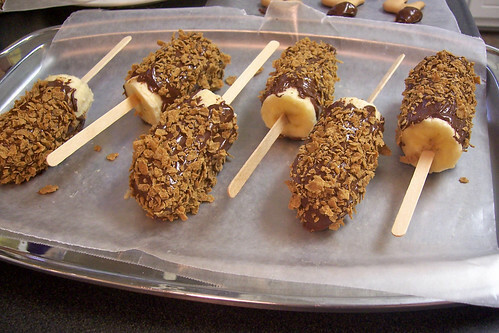 But I discarded that idea and just melted the chocolate, dipped the ‘nanners right in, and rolled them in the crushed cereal. More chocolate is always better, right? We set them in the freezer on a tray covered in wax paper, and waited for lunchtime. Uncle Drew came over for lunch, and we were able eat our Monkey Treats after our M-themed lunch: meat roll-ups, macaroni and cheese, Mandarin oranges, and milk. Wait – why does Uncle Drew always get to eat our yummy projects? Along with the Monkey Treats, I wanted to start sharing the idea of hospitality with EJ by making the meals we share with others special times of fellowship. Before I had kids, a homeschooling family that lived close to my work invited me over every Wednesday for lunch, and it was a time for their girls to learn more about preparing a meal for a guest – from setting the table to table manners to conversational skills. Plus, what a blessing it was to me to be able to share a delicious meal with their family! I would love to pass on such a wonderful tradition to my boys – and hospitality is a Biblical trait that we are urged to practice (Romans 12:13, Hebrews 13:2). Uncle Drew has a standing lunch date at our house on Tuesdays, and we will begin to practice our hospitality with him then – and with all others who join us in our home. EJ helped me set the table… forgive the camouflage tablecloth. In my house, this is what it means to live with all boys. Notice we each had a map place mat, and there were also hand-made monkeys that joined us at the table. Uncle Drew and EJ gave our M-themed lunch the thumbs-up, and then we dug in. The monkey treats were quickly devoured – and I tell ya, I’m not much of one for bananas, and I loved these things. I will definitely be making these again! The banana was a bit hard for EJ to eat off of the popsiclestick, so I wound up slicing it in half so he could just pick it up with his hands. EJ also wrote a “Thank You” note to Uncle Drew for joining us for lunch, and then EJ asked him back for lunch next week! Hopefully, we are on our way to learning what hospitality truly means. 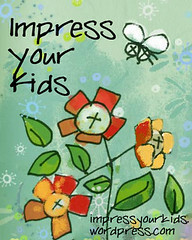 What Biblical traits are you working to impress on your children? How are you doing it? Will you please share with us? Write a post on your own blog with a kid-friendly idea that ideally shows your kids impresses God’s Word on their hearts. This idea can be a craft, a tradition, an activity or whatever else pops into your mind! Be creative! Welcome to Week 2 of Fall Impressions! This idea has been all around the web lately, and in fact, last week Karla shared with us her beautiful Thanksgiving Tree. I don’t remember doing anything like this as a child, so this idea fascinates me – having the chance to physically be able to write down and see everything you are thankful for – everything that the Lord has done for you. As we were gluing shiny turkeys, leaves, and acorns to the jar, I started asking EJ what he was thankful for. He’s been telling us for the past week that he is thankful for his Uncle Drew, so he’s been on the right track… we talked about other family members and his friends. Daddy added that he was thankful for the food God gives us, and the warm house we have… it was a really nice time of sharing that I hope carries on through the years. 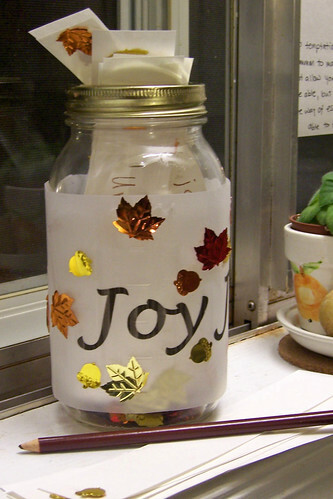 We added the confetti to the strips of paper, too, and I plan on asking anyone who comes over this season to write down some things they are thankful for and add them to our jar. I will add that this is not how I wanted the jar to look. I had confetti all over the top of the jar, too, and it looked like a crown of leaves! There was a lot more confetti all over it, too… all of this I added after EJ lost interest and wandered off. When he came back, he did not like the way I decorated the jar. He removed all the confetti from the top and a lot from the sides. And truth be told, this even happened one more time – I decorated it the way I wanted it again, and then I put it up on the counter so EJ couldn’t reach it. But when he saw it, he started crying and wanted to “fix” the jar again. As I was ready to stand my ground, my husband asked me if I did this with EJ just for this blog, or if I did it for him. Thank you, my love, for reminding me why I really did this activity with EJ, and for helping return the joy to our family. 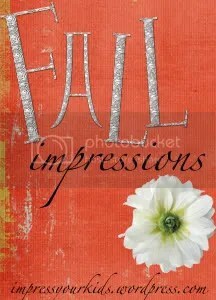 To participate in Fall Impressions, write a post on your own blog about a great fall/autumn/thanksgiving activity. Make sure this idea is kid-friendly and ideally shows your kids the truth about the season or impresses God’s Word on their hearts. This activity can be a craft, a tradition, an activity or whatever else pops into your mind! Be creative! Welcome to our first week of Fall Impressions! Let’s jump right in, shall we? First is my big idea, the Mr. Linky is below for you to link up! I haven’t done my activity with Lydia yet. *gasp* I wanted to do it today but voting and some other crafty goodness (I’ll show you soon…) got in the way. But I’ve got all the STUFF to do this idea and I’m so excited about it. This month at church, we’re collecting canned goods for a local charity organization. I really want Lydia to have the desire to give to others. I want this to be an automatic response for her. Not just during Thanksgiving or when there’s a push for it, but all the time. But this time of year, is a great time to introduce her to giving AND a great time for her to get really excited about it. 2. Pour paint out on paper plate (or something) to dip veggies in. 3. Tape bottom of cardboard box, leave top open. 4. 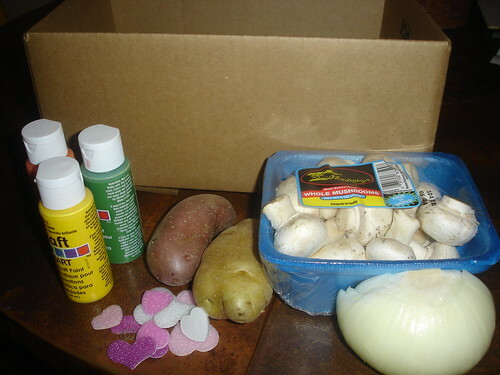 Use veggies as stamps and decorate the outside of a cardboard box. I’m planning on decorating the outside of the box not just with veggies but with our V verse and possibly with phrases like “Jesus Loves You” or “We’re thankful for you!”. I know that no one will ever see the box and admire it’s handiwork. Our church just asked us to bring the cans in a box because it’s easier to pack. But I want to decorate it because it will impress this activity even more into Lydia’s mind. I want her to remember the time and effort we spend on giving. Then, we’re going to head off to the grocery store to fill our box! I’m going to let Lydia pick out whatever canned veggies (more “v” stuff!) she’d like (within reason, of course!) and fill the entire box. This will be the only thing we’ll buy at the store. I want her to see how important this is! Now, onto my favorite part! When we get home, I’m going to let her decorate the tops of the cans! I’ve got some awesome glittery heart stickers that Lydia has been DYING to use. I’m going to let her put a heart sticker on the top of the can and I’ll write “Jesus Loves You”. So, maybe, just maybe, whoever gets these cans will see that little message and they’ll realize that it’s true! And I hope my little girl will remember this activity—to remember those in need, to remember that even little things make a big difference and most of all to remember that we are to tell everyone, in every way that Jesus loves them! Well, there’s my fall-thanksgiving-ish idea! Let’s see what you’ve got! All you have to do to participate is write a post on your own blog about a great fall/autumn/thanksgiving activity. Make sure this idea is kid-friendly and ideally shows your kids the truth about the season or impresses God’s Word on their hearts. This activity can be a craft (love ’em! ), a tradition (my fave), an activity (like mine) or whatever else pops into your mind! Be creative! 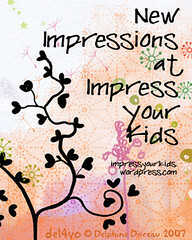 We’re starting a new weekly column here at Impress Your Kids! Each Wednesday we’ll post a fun seasonal craft, activity, tradition or recipe. Then you can show how uber-creative you are by posting your very own seasonal activity on your blog. We’ll provide a Mr. Linky here for you to link up and show off! This month is November (obviously) so we’ll do a Thanksgiving/Harvest/ Thankful/Autumn theme. This is a very loose theme so it can be anything you like. 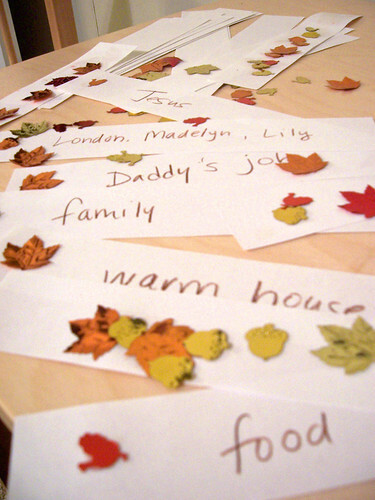 BUT the idea is that you use this activity to impress your kids with the real meaning of the season. We’ll keep the Mr. Linky up all week, so if you can’t get a post up on Wednesday, don’t worry. You’ll have all week to read everyone’s posts and post your own! So get your creative juices flowin’! I can’t wait to see what you come up with!